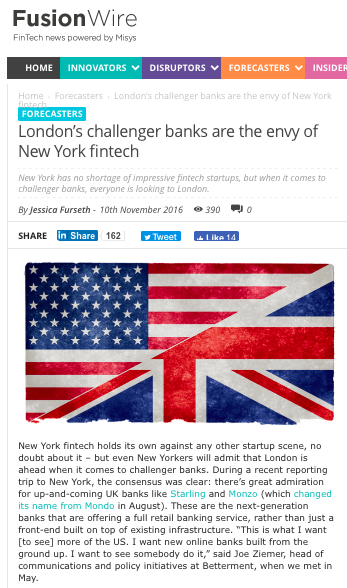 New York fintech holds its own against any other startup scene, no doubt about it – but even New Yorkers will admit that London is ahead when it comes to challenger banks. During a recent reporting trip to New York, the consensus was clear: there’s great admiration for up-and-coming UK banks like Mondo and Starling. These are the next-generation banks that are offering a full retail banking service, rather than just a front-end built on top of existing infrastructure. “This is what I want [to see] more of the US. I want new online banks built from the ground up. I want to see somebody do it,” said Joe Ziemer, head of communications and policy initiatives at Betterment, when we met in May. Starling and Mondo both secured UK banking licences this summer, joining the dozen-plus new banks that have received licences since 2013; that was when UK regulators changed the rules in an effort to encourage innovation in the retail banking sector. Goals are lofty and ambitious and there’s money available to pursue them: Starling raised $70m in January, while Mondo was valued at £30m following its £6m fundraising in February. In May, new name Tandem raised £1m on crowdfunding platform Seedrs in less than 20 minutes. In New York, leading US robo adviser Betterment is an example of a fintech startup that provides a full service, rather than just repackaging products from traditional financial groups. There are two key benefits to this approach, says Ziemer: “One is the user experience. If you open a Betterment account you will open the entire thing in two minutes – the advisory relationship and the brokerage relationship. … If you fund your account tonight you’ll be fully invested tomorrow morning.” This is possible because Betterment handles everything in-house, and no outsourcing means no delays, no profit-sharing, and overall full control. Building from scratch – like Betterment is doing as a US robo adviser, and Mondo is doing as a UK challenger bank – has drawbacks. For one, it takes much longer. It also requires more funding up front, as years can go by before the product can be launched and even then, it can take years to make money. But if successful, the payoff will be a company that’s central to the customer, rather than a nice-to-have. An example of this is how we may use a service like PayPal, but this is useless without a bank account: our central relationship is still with the bank. The overall goal of Betterment gets to the heart of this, says Ziemer: “We want to get to a place where we are the client’s central financial relationship.” For UK challenger banks, the goal is the same – this is what’s caught the admiration of the New York fintech scene. Podell says London has done a remarkable job at boosting its fintech scene, which unlike in the US, benefits from being focused primarily in one place. But the UK still lags behind when it comes to funding. In North America, VC-backed fintech companies raised $1.8 billion across 128 deals in the first quarter of 2016, according to KPMG and CB Insights, which concluded fintech deal activity in the region is on track to reach a new high this year. In Europe, funding numbers for the period came in at $0.3 billion, and half of this went to WorldRemit and LendInvest. “Fintech investment in Europe has certainly been less overheated than in other markets,” CB Insights CEO Anand Sanwal said when the numbers were published, adding that this has resulted in increasing interest from US and Asian investors. These number do however pre-date Brexit, which has created uncertainty; London’s ability to hire people from all over Europe has been a significant asset when it comes to competing with the US. Posted on 09/11/2017 by Jess. This entry was posted in JF. Bookmark the permalink.